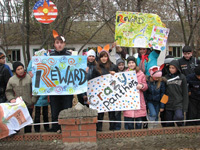 Linguistic Camps for schoolchildren «Magic World of the English language» are one of the major educational directions of FLC Reward. 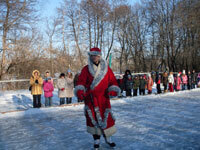 They are organized at least twice a year – during winter and summer breaks – for schoolchildren of 7-16 years old. 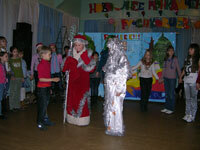 The camps are always themed and they help to broaden their outlook and stimulate overall development. We’ve already succeeded in organizing six differently themed linguistic camps. 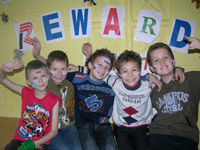 The summer camp 2010 was devoted to Great Britain. It was called «Discovering Great Britain». Besides daily English classes in small different age and level groups with usage of audio and video materials, we also carry out various interesting activities which excite and entertain the children. The development of linguistic camp program takes several months and our most experienced and creative teachers are involved in this process. They work with schoolchildren at our courses and clearly understand their psychology such that they can make the camps activities interesting and informative. Our highly-skilled and professional teachers, Russian and foreign from the USA and Great Britain, work as camp counselors in our linguistic camps of FLC Reward. We always bring to the camp a big screen with a projector to provide visual presentations about the camps particular theme. These broaden the children’s knowledge of other countries. These camps help to advance the students’ language skills and develop motivation for further study whilst, of course, contributing to the creativity of schoolchildren. All these are combined with great rest and health improvement achieved by different sports activities and outdoor projects. 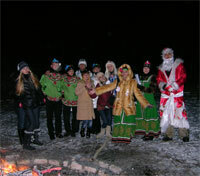 We choose the best complexes in the Volgograd region for our linguistic camps. 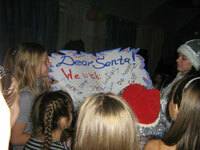 This year we are planning to do it on the clean, healthy facility “Skazka”, not far from Volzskiy town. It’s a comfortable place for children to spend their holidays: 5 meals a day, comfortable accommodation, a swimming pool, different sports courts, football pitches and basketball courts and many more great facilities for different sports events and entertainment. Our linguistic camps are organized in two shifts in summer: in July and in August. You can choose any, but do not postpone buying a camp voucher as they are limited. Our winter camp absolutely sold out. 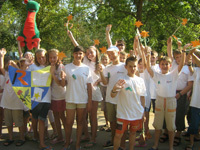 Besides the linguistic camps for schoolchildren in Volgograd region FLC REWARD with its English partner – the world famous language school, St.Giles International – organizes summer trips for children to Great Britain and the USA. The main peculiarities of such trips are that we organize them on the premises of leading English and American universities in July and August, when there are no students and our schoolchildren have a chance to live in the student campuses, even in great universities and university towns like Oxford, and study English with professional English teachers. The program includes not only quality lessons in the English language but also various cultural and heath-improving activities. Children have an opportunity not only to improve their English but also to learn about and witness, first hand, the culture and the most famous sights of Great Britain and the USA, and to learn more about different countries as they will be spending time with fellow students from all over the world. These camps have a great reputation and are fantastically well run.